In addition to reprojecting the event data to the reference frame of the object, the sso_freeze tool can create an object-centered aspect solution file. The new aspect solution file may then be used to generate an exposure map or response file (ARF) for the data. This thread focuses on how to use the aspect solution file. The Reprojecting Coordinates of a Solar System Object has more general information on running sso_freeze. 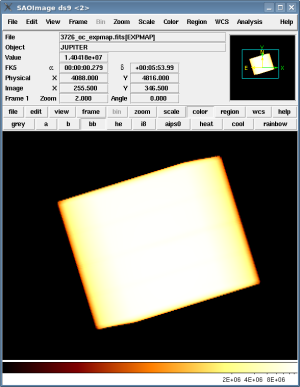 To create an object-centered aspect solution file for a solar system object and build an exposure map with it. Last Update: 30 Jan 2017 - Reviewed for CIAO 4.9. Updated final image to match direction of RA. 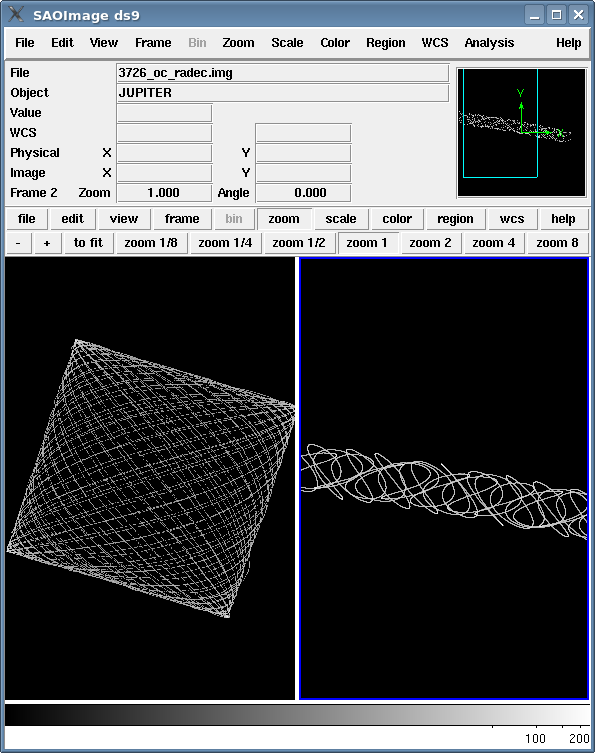 There are two ephemeris input files needed for the tool to run: the spacecraft ephemeris file (scephemfile) and the SSO ephemeris file (ssoephemfile). Both of these files are part of the primary data products. In WebChaSeR, they are listed as the "MT (moving target) ephem" and "Orbit ephemeris" data products. Make sure that the timestamp in the filenames is less than the start time of the data. Also, if there is more than one version of a file - e.g. N001 and N002 - choose the newest (higher number) version available. Spacecraft and SSO ephemeris files are also available from the CDA FTP site (cda.harvard.edu) if you have trouble retrieving them via WebChaSeR. Login as "anonymous", using your email address as the password; the files are in the /pub/arcftp/bary/ephem directory. Once you have the necessary input files, you are ready to run the tool. The contents of the parameter file may be checked using plist sso_freeze. Jupiter is displayed in object-centered (OC) coordinates (ocx,ocy) in Figure 1. Notice that in the reference frame of Jupiter, the point source at (4099,4092) becomes a long streak. The source may be removed from the field with the dmcopy or dmfilth tools, if desired. In the reference frame of Jupiter, the point source at (4099,4092) becomes a long streak. In the new event file, the origin of the OC coordinate system is (0,0). The RA and Dec header keyword values are updated to reflect this, so that the correct reference point is used in the rest of the analysis. You can check the parameter file that was used with plist dmhedit. With the OC aspect solution file we can create a binned histogram detailing the aspect history of the observation. Data Model syntax is used in the infile parameter to rename the "OCSOL" block to "ASPSOL". The "ocra" and "ocdec" columns are also renamed on-the-fly to "ra" and "dec", respectively. The changes are required because asphist expects the block and columns to have those names. If you created more than one OC aspect solution file, all the files must be input to the infile parameter, either as a list or as a stack. unix% pset asphist infile="3726_oc_asol1.fits[OCSOL][cols time,ra=ocra,dec=ocdec,roll,dy,dz,dtheta][ASPSOL]"
In this example we choose to create a monoenergetic distribution of source photons of 1.0 keV. The ACIS dead area correction is not applied. This observation of Jupiter falls on chip ACIS-S3 (ccd_id=7). You may need to change the detsubsys parameter value for your observation. Note that it is not necessary for the instrument map to be congruent with the exposure map; the instrument map should describe the chip with full resolution. We will use the default values for the detector region (pixelgrid parameter), creating a 1024 x 1024 pixel image that covers the whole chip. Including the maskfile parameter is particularly important if you are interested in having an accurate exposure map at the very edge of a CCD, subarray or window. For more information, see the dictionary entry on mask files. You can check the parameter file that was used with plist mkinstmap. 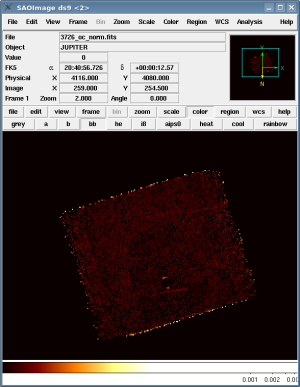 Now we use mkexpmap and the aspect information stored in the histogram to project the instrument map onto the sky. The xygrid parameter is set to produce a 512 x 512 pixel exposure map, centered at (4096,4096). The exposure map may be displayed in ds9 (Figure 2). You can check the mkexpmap parameter file that was used with plist mkexpmap. Data Model syntax is used to create a virtual image for the infile parameter which has the same binning used in making the exposure map. unix% pset dmimgcalc infile="3726_jupiter_oc.fits[bin ocx=2048:6144:#512,ocy=2048:6144:#512]"
The units of 3726_oc_norm.fits (Figure 3) are [photon/cm2/s/pixel]. You can check the parameter file that was used with plist dmimgcalc. This section is an optional exercise which demonstrates that the OC event file and aspect solutions are consistent. Next, create images of the aspect solution in (ra,dec) and (ocra,ocdec). The dmstat tool is used to determine the limits for the binning. The object-centered aspect solution is in the left frame and the original aspect solution (target RA,Dec) is in the right frame. 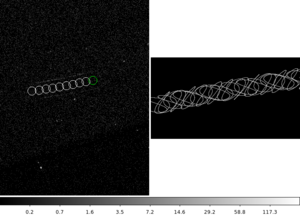 The OC (RA,Dec) coordinates drift over time (left ds9 frame), representing the increase in distance between the OC origin (Jupiter's position) and Chandra pointing as Jupiter moves across the sky. In the right ds9 frame there is no drift, as the pointing does not change with respect to the telescope. The event data is in sky coordinates (left ds9 frame). The circular regions (loaded from sso.reg) represent the current position of Jupiter, with the most recent position in green. These data show Jupiter moving higher in Dec (up) and lower in RA (right) over time. Left frame: event data is in sky coordinates; RA decreases to the right along the x-axis. The circular regions (loaded from sso.reg) represent the current position of Jupiter, with the most recent position in green. Right frame: OC aspect solution in (RA,Dec) coordinates; The right most edge of this data have the earliest timetags, so the dither pattern is moving from right to left over time. Note: The size of the circle is not the size of the solar system object. It is the step size (so a function of the number of regions). The OC aspect solution is in (RA,Dec) coordinates (right ds9 frame). The right most edge of this data have the earliest timetags, so the dither pattern is moving from right to left over time. The distance to the Chandra pointing vector (RA_NOM, DEC_NOM) as seen from the position of Jupiter moves lower in Dec (down) and higher in RA (right) over time. Therefore, the event image and OC aspect image are consistent: from the fixed EQPOS frame, Jupiter moves higher in Dec and lower in RA. Looking back from Jupiter, the fixed dither pattern appears to be moving in the opposite direction: lower in Dec and higher in RA. (clobber = no)              Overwrite existing output dataset with same name? #  the many pointings in the aspect histogram will be used. 03 Dec 2012 Review for CIAO 4.5; mkexpmap chatter removed. 02 Apr 2013 Changed reference from Chaser to WebChaser. 30 Jan 2017 Reviewed for CIAO 4.9. Updated final image to match direction of RA.